The Shetland Islands, a large group of nearly 100 islands (30 inhabited), are the northernmost part of the British Isles. The current population is estimated at just under 22,000, with the vast percentage of people residing on Mainland (the largest island). 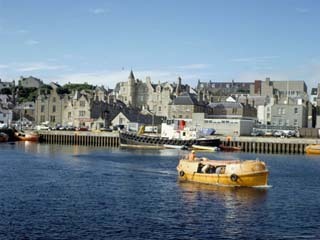 Lerwick is the largest populated town. 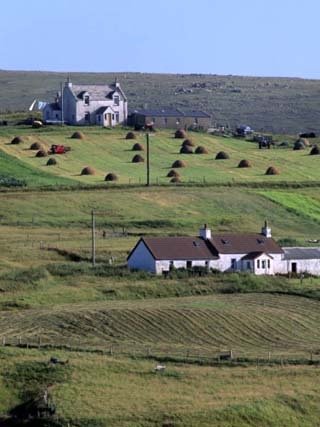 It was during the 9th century AD when Scandinavian Vikings began establishing colonies on the Shetland Islands, and the region fell under the rule of Norway until the 14th century when the islands were pawned off to Scotland. The Black Plague severely weakened Norway in the late 1300's, and ultimately their economy began to falter. When King Christian's daughter became engaged to James III of Scotland, the king had no money to pay her dowry, and unknown to the Norwegiancouncil he entered into a commercial contract with the King of Scots in 1468. The Shetland Islands began selling their goods through German merchantmen in the early 15th century, and this lasted until the 1701 Act of Union which banned the merchants from trading with the islands. Consequently, the Shetland Islands fell into an economic depression. To further add to this hardship, the islands were passed back and forth between the Crown and courtiers no less than fourteen times as a means of garnering income. Through this ordeal, the Shetland Islands association with Norway hardly wavered, and the islanders pridefully looked to Norway as their motherland - despite being under the rule of Scotland. During World War II the Shetland Bus was established by the Norwegian navy, and was used as a means of administration along the Norwegian coast. Based first at Lunna, then Scalloway, the Shetland Bus made over 200 trips across the sea under the command of Leif Larsen. Late into the 20th century oil reserves were discovered both east and west of Shetland providing a new source of income for the islands. The North Sea oil business, as well as cattle and sheep raising are the major contributors to the economy. The islands are famous for indigenous Shetland Ponies, hand-knitted wool sweaters, world-class fishing venues and copious wildlife - especially birds and seals. The island are well-served by regional airports and ferries. Note that the islands are actually closer to the coast of Norway than mainland Scotland.